In recent years renewed attention has been directed to the importance of the role of institutional design in democratic politics. Particular interest has concerned constitutional design and the relative merits of parliamentary versus presidential systems. 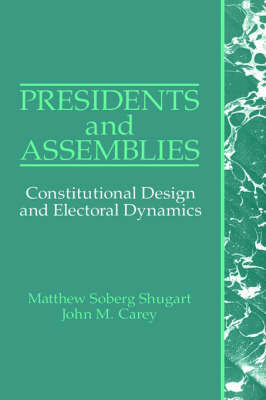 In this book, the authors systematically assess the strengths and weaknesses of various forms of presidential systems, drawing on recent developments in the theoretical literature about institutional design and electoral rules. They develop a typology of democratic regimes structured around the separation of powers principle, including two hybrid forms, the premier-presidential and president-parliamentary systems, and they evaluate a number of alternative ways of balancing powers between the branches within these basic frameworks. They also demonstrate that electoral rules are critically important in determining how political authority is exercised.